People travel from all over the world to see the bright blooms of Tulips at Roleystone's famous Araluen Botanic Park, and on Saturday 11th August they’ll provide a living backdrop to a runway show. With contributors from both the Perth Hills Armadale region and Western Australia, regulars on the WA fashion scene will be familiar with WA design house, ae’lkemi – headed up by 3-time WA Designer of the Year Award-winner (and nominee for a further two), Alvin Fernandez. 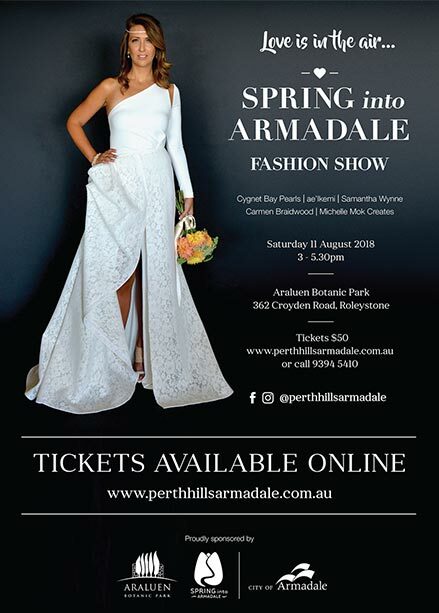 Trading the catwalks of New York, London, Milan and Berlin Fashion Week for the gardens of Araluen, Fernandez will bring his signature seductive-yet-feminine elegance to the show, for a very special afternoon in the Perth Hills Armadale. You’ll also get a sneak peek at new, springtime looks from internationally-renowned wedding gown designer, and Mt Hawthorn bridal boutique owner, Samantha Wynne – who hopes to champion WA’s burgeoning bridal design industry while enjoying some canapes in this picturesque setting. Finally, from the stunning Kimberley coast of WA, attendees will be able to view jewelry provided by the the nation’s first Australian-owned-and-run South Sea pearl farm, and one of only three remaining in WA: Cygnet Bay Pearls. This year, I’ve been asked along as MC, to share with you not just these incredible examples of WA fashion, but the best of what the region has on offer, in my role as #PerthHillsArmadale Ambassador. I hope you’ll come along for a glass of bubbles, some photos in a beautiful setting and with a bit of luck, some late-winter sunshine! These are the things I, and many others who visit & live in the Hills of Perth just love about our backyard and we’d love for you to see it in all its glory. Now, here’s where things get super-fancy: the event is styled by Fashion Advocate Cat Birch, who when she’s not home in WA is kept busy in her roles as Senior VP to ASEAN World Fashion Brands and Merchandising Groups, World Fashion Organisation and as Corporate Advisor to none other than Professor Datuk Dr. Jimmy Choo. Birch has been working with local young adult women in her “Life Skills Program”, which uses art and fashion as an engagement tool to pass on skills in teamwork & leadership. 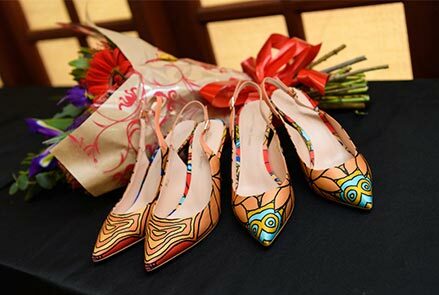 Activities include social etiquette, dance, public speaking, hair and makeup, styling, photography and event management. Several graduates from the course will serve as models in the fashion show. Cat Birch also styled the photo-shoot for the images being used right now to promote the event. That’s me, looking quite the fish out of water in a real-life fashion shoot – but loving the experience all the same. We took these photos in the type of Mt Richon home I dream of living in myself one day (c’mon Powerball!). Set at the top of a winding gravel drive, over-looking gulleys filled by tree-tops and a crystal-clear view that extends right through to the Perth city skyline. It’s the family home of well-known film & television hair & make-up artist, Simone Lee. Lee is responsible, not just for my camera-ready hair & make up but also this incredible photography. A woman of many talents and her home: drop-dead gorgeous! I’ll be back with plenty more from the on-going Spring into Armadale calendar in coming weeks, so be sure to keep checking in here or on any of my social media accounts. This is going to be LOTS of fun!